Explosion near IDF vehicle on patrol near the Syrian border causes no injuries. IDF investigating. A powerful explosion was heard on Friday evening in the Golan Heights, near an IDF vehicle that was on routine patrol along the Syrian-Israeli border, near the slopes of Mount Hermon. No one was injured as a result of the explosion, but damage was caused to the rear window of the military vehicle. The explosion was so powerful that it was heard for kilometers away, and many forces were called to the scene to investigate. It is believed that the explosion was caused either by an explosive device, a mine that was swept away in the winds and the rain, or an explosion from the Syrian side of the border relating to the civil war in that country. The army is expected to continue the investigation in daylight. If the explosion is related to the Syrian civil war, it will not be the first time that the country’s civil war has spilled over into Israel. On Monday, IDF forces on the Golan Heights near the Syria border were shot at from a Syrian army outpost. The IDF returned fire and identified a direct hit on a Syrian soldier. No IDF soldiers were injured. 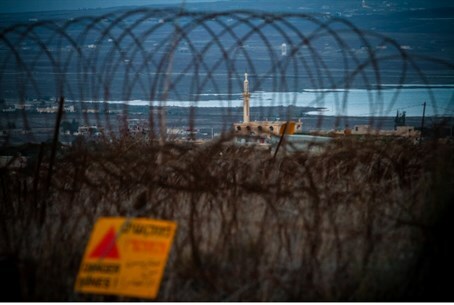 The clash followed a mortar shell fired into Israel from Syria earlier in the day. The shell landed 50 meters (160 feet) from a house in the Israeli Druze town of Majdal Shams in the Golan Heights and caused no injuries or damage. In October, two Israeli soldiers were lightly wounded by cross-border fire in the Golan Heights, along the border with Syria. Israel's Ambassador to the United Nations Ron Prosor has sent a letter of complaint to the Security Council denouncing a series of Syrian violations of the 1974 ceasefire agreement between the two countries. In one such incident, gunfire from the Syrian side of the border hit close to an IDF patrol in the northern Golan Heights. There were no injuries or damage.